So this squad has been done for a while now, but like some of my other projects, it hasn’t had much love on the picture side. The banner, a few heads and the mace arm all come from the Chaos Knights kit for fantasy, but work well from my marines. 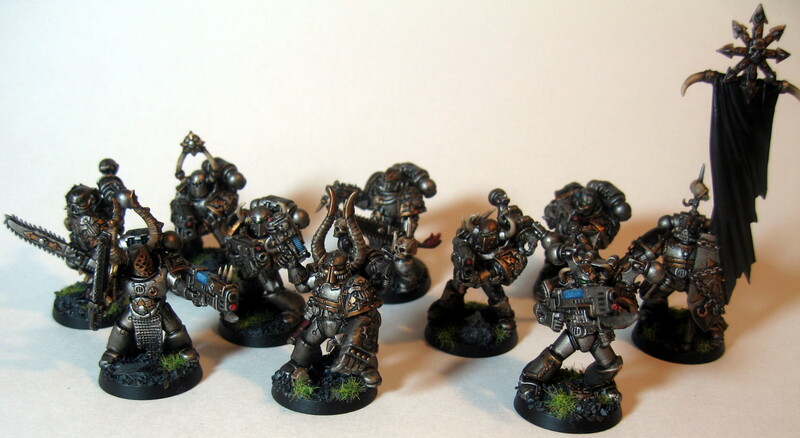 This squad is plasma heavy with a plasma pistol and power fist bearing champion and two plasma gun luggin’ fools. Although these guys do a great deal of damage throughout my games, they usually don’t survive. Inevitably I roll a one when trying to blow up the tank to win the game, and fail my armour save. Oh well, they look cool and pack a punch! Although this squad is “done” I still need to figure out what to paint on the banner and add in the XIVs to the shoulder pads. I often field this squad in a Rhino as one of the attacking squads for any capture objectives missions. This allows me to move the tank 12″ up and still fire both plasma guns into the target while maintaining the protection of the tank.